How could composting be made easier? 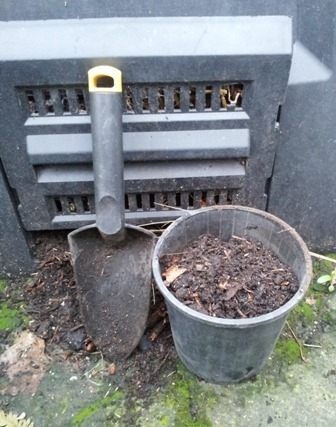 By not ever having to turn the compost and not having to move the compost into your garden, that’s how! You can get Nature to do even more of the work with a Worm Tunnel, an in-ground worm farm that’s a cross between a small compost bin and a worm farm that sits in your garden (in the soil). You just throw in your fruit and vegetable scraps from the kitchen and that’s it, the worms that live in the soil in your garden do the rest. The worm castings and the liquid from the worm farm all go straight into the soil where they are immediately available to plants and trees. 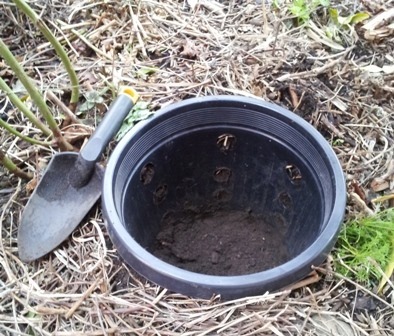 Worm tunnels are cheap and easy to make, and can be made from recycled plastic plant pots. They can process the same materials as any other worm farm, and best of all, they can be made in a few minutes, as explained in the instructions below. 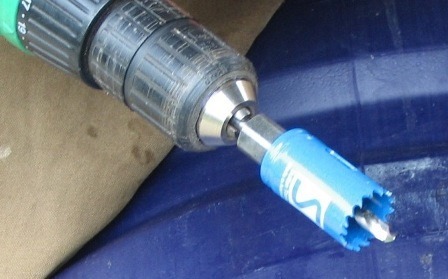 A drill and drill bit at least 3/8” (10mm) thick or larger to make the holes in the side of pot. A pair of sturdy scissors or metal cutting shear or whatever else you wish to use to cut the bottom off the pot. I prefer to use make large 1” (25mm) holes with a holesaw as I drill less holes that way. Here’s what a holesaw looks like in case you’re wondering! I just used some heavy duty scissors/shears to do this, use whatever works easily. 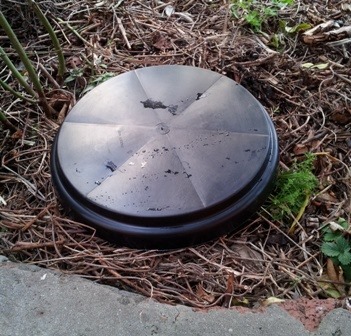 Test fit the lid to make sure it fits – it’s now ready to go into the ground! Dig the hole, and sit the worm tunnel in the soil, fill around the sides with soil. NOTE: Choose an accessible location, near a path or walkway, as you’re more likely to put your kitchen scraps in a worm tunnel if you can get to it easily or pass along that way often (This fits in with the Permaculture design principle of Relative Location)! 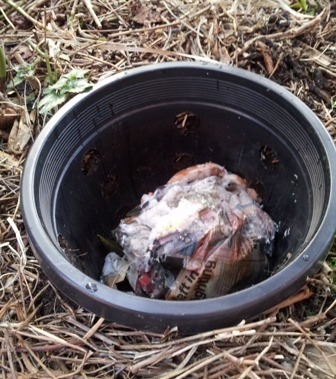 Get some compost from your compost bin an pour it into the bottom of the worm tunnel. This will introduce beneficial soil organisms that will assist with the composting process. Add fruit and vegetable scraps and other materials that you would normally put into a worm farm (see worm farming article for details). 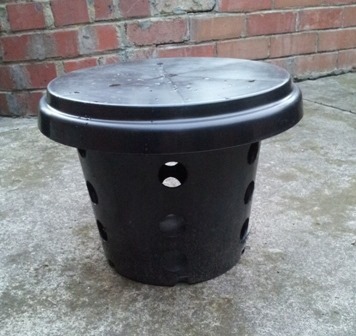 Place a cover over the food scraps to create a dark, damp environment favourable to earthworms. This cover (worm blanket) is simply made out of a folded piece of damp newspaper or a scrap of damp hessian sack that is placed over the top of everything. Whenever you add new material, place it under the newspaper or hessian worm blanket cover. Put the lid on the worm tunnel. It’s very discrete and easy to disguise or hide if necessary. 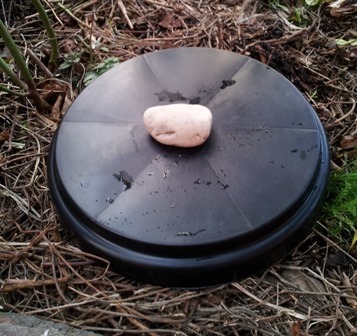 To stop the lid blowing off in the wind or to prevent animals getting inside put something heavy on top (such as a rock)! All Finished! Now just sit back and let the earthworms do the work. Within a few weeks earthworms will move in from the soil and start feasting on the food scraps in your worm tunnel. Inside an established worm tunnel, lots of earthworm activity! Despite the size, you won’t fill up a worm tunnel in a hurry! A 300mm (12”) wide standard pot has a volume of approximately 12L (over 3 US gallons) so there’s a bit of space in there. As you add material, it will pile up initially , then break down and reduce in volume. It will take a while before the whole tunnel is filled with worm castings, around two years in fact, because most of the volume of fruit and vegies is actually water! If you’re generating a lot of kitchen scraps, you make a few worm tunnels and install them all around the garden. When the worm tunnel fills to the top with worm castings, just lift the whole thing out of the ground, leaving the nutrient rich worm castings behind in the soil of course, and move the worm tunnel to a new spot in the garden and start again! The original worm tunnel concept can be credited to Linda Woodrow, permaculture writer/experimenter from NSW, Australia and author of The Permaculture Home Garden. Her idea was first published in an article in Australian Organic Gardener in 2000. As she has indicated, the idea has grown and evolved since then! The design shown above is my own design, and will work very well. You can also use various other containers to build a worm tunnel in-ground worm farm. -then it should work just fine, so feel free to experiment. My design is very utilitarian and functional because that’s what I prefer, but if you want something fancier looking, then feel free to let your creativity run riot. Here’s a worm tunnel design in a friend’s garden that involves the use of recycled materials and looks rather ornamental. Is really the top of a bottomless container brimming with earthworm activity! You can make your worm tunnel bigger than the one in my design, but keep in mind that if you use a very tall container, you’ll have to dig a very deep hole, and that may prove very discouraging or even impossible if you hit solid clay! You also need to be able to pull it out of the ground once it is full too! My recommendation is to start with the size I’ve recommended, I’ve chosen that size because it’s quite manageable, and if you succeed and you’re confident you can manage it, then by all means go bigger. Worm tunnel in-ground worm farms are a very energy efficient solution to recycling fruit and vegetable kitchen scraps. They really tie in well with sustainable gardening and Permaculture principles on several levels. They are low energy because you never have to move the worm castings from worm farm to garden, or dilute the leachate liquid and water it into the garden, the products are created exactly where they will be used. They make good use of biological resources, the whole soil ecology is used to recycle nutrients and create more soil. It’s a decentralised and resilient system, because you can have many worm tunnels all around the garden, so if anything were to go wrong with one of them, the rest will continue on happily. They’re also self managing, you don’t have to worry about the worms either, because they are earthworms, not compost worms, they can find food elsewhere if you forget to feed them, and they can tunnel deep into the soil where it’s cooler if the weather gets too hot. They can be made cheaply with recycled materials and as an added bonus they take up very little space because they sit below the ground. It’s definitely worthwhile spending a few minutes to build a worm tunnel, you’ll be glad you did, and so will the earthworms in your garden! Great stuff – thank you very much. I was just about to build my first worm farm but this is much easier, cheaper, quicker and more convenient. The article didn’t mention the fact that the worm casts are not distributed to the plants (or do the worms take them there?) I guess the roots of nearby plants will get into it. And I guess I could shuffle out a a bucket full every now and then and distribute it in other parts of the garden. Or do I miss something here? The worms will distribute the castings in the area around the worm tunnel, but there’s nothing stopping you from taking some of the completed worm castings out by hand when it’s full and digging them into another part of the garden of you like! I don’t think that will be coming out too easily! I’m guessing it’s a very permanent setup. I think I can claim credit for the concept, published in an article in Australian Organic Gardener in 2000. I love the many ways it has grown and been refined since. Thanks for coming forward Linda, it’s great to be able to attribute a great idea to its founder, this is exciting! I’ve amended the credits in the article! It’s a great concept… but don’t think you’re the only one who can claim credit LOL. But awesome you wrote an article about it to spread the word. My great grandfather (who would be over 125 years old now), did this with 2-10 gallon plant containers back in the 40s at least my Mother remembers when she was a child. She said he had stepping stones over them. She did it too and passed down the idea to me. I’m in process of doing it now in my mini orchard and have done smaller ones in my perennial gardens and cover with decorative stepping stones. Every few years I move them around when I divide my plants. Perfect example of another age old forgotten knowledge we need to pass down to our children. Thanks for sharing this, it’s great when old wisdom is not lost but rediscovered! Two thoughts: 1. We could build them with untreated wood (Square) and leave them in to slowly break down if you only want it for a few years and no work to remove it. 2. Deep watering the roots? Do you mean putting water in the bucket? But do the worms like that? I have a similar system, but i would like to add a note that these will do better if compost worms aka tiger worms are introduced. They eat and multiply much faster than regular earthworms. also regular earthworms do not like to be crowded, but tiger worms do! I also put an empty bucket on top every now and then and then put fresh food into that bucket. The worms migrate up leaving the castings for me to spread around wherever I want to put them. I move the buckets around in my garden to spread the goodness. 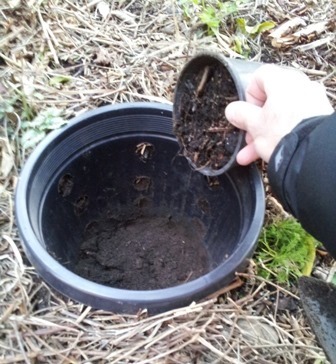 Here are some blog posts on my worm buckets for anyone who is interested. 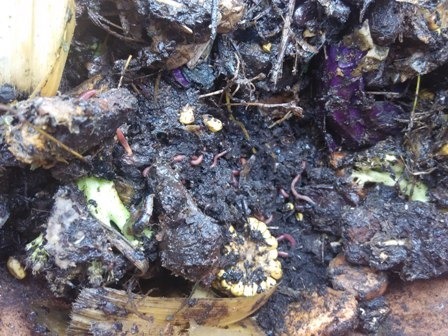 As I’ve stated in the worm farming article (https://deepgreenpermaculture.com/diy-instructions/worm-farming/) compost worms may eat twice as much as earthworms, but need constant food and can’t burrow deep to escape heat, so they’re not as resilient as earthworms! Permaculture is about low energy, low inputs, low maintenance! I also have three regular worm farms in my garden! Hi, thanks for your comments. I think the idea with the earthworms instead of tiger worms is that it saves the work of spreading the worm castings around manually. It seems they just come to feed and then go back into the soil, work the soil and fertilize it with their droppings. And if you are away for a holiday they will survive without feeding. It might be a bit slower but after it is set up the system works for a long time without any human input. I’m a dog owner, so I’ll be putting a heavy paver on top. My dog loves compost, the more rotten the better. I’ve heard of a dog who was taken to the vet with a mystery on-going illness until they discovered he love the open compost heap. Great idea to stop dogs getting in there, they are naturally scavengers and will have a go if they think they can eat what’s in the compost! Hey angelo, we meet again 🙂 I am going to try this. I had one doubt tho. What about rat or mice menace? If the worm tunnel is buried in the ground with the lid held down firmly, rats and mice won’t be able to get in. 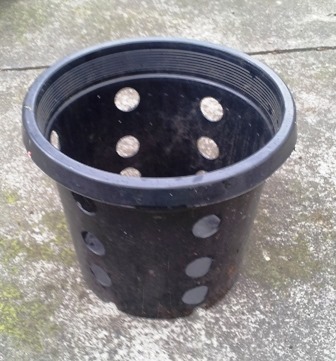 If you have problems, you can just drill the holes on the lower half of the sides of the pot, or just use smaller holes when you construct it, and use a heavy lid, some people use large terracotta pot saucers, a piece of fibre cement sheet or a paver. Since people do set up worm farms for pet poo, mind you these are PET POO ONLY worm farms, then I can’t see the difference. 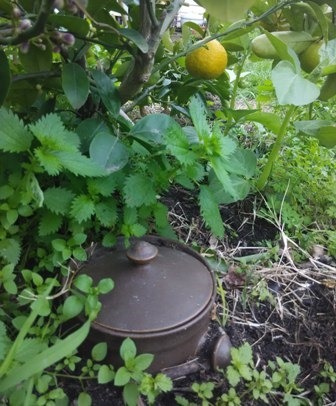 Just make sure there is no possibility of pathogen contamination, so I would put it in an isolated part of the garden, away from any vegetables and other edibles that grow close to the ground that you eat fresh. Also, don’t put it in an area that would be prone to flooding or water swamping. Other than that it should be right, because it’s not too far removed from just burying it in the soil. So I can use it for fruits, flower and grass then right? A worm tunnel is a worm farm, so anything that can go in a conventional worm farm can go in a worm tunnel vermicomposting system. Fruit, yes, flowers, yes, grass no. 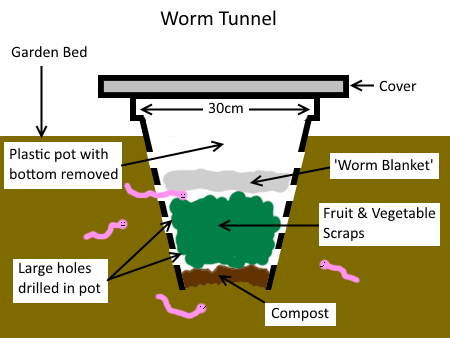 For details on what you can and can’t put into worm farms, see my article https://deepgreenpermaculture.com/diy-instructions/worm-farming/ , the relevant section is “What to Feed Your Worms”, which is just before the halfway mark on that page. This is a blast from the past. My grandad had these in his allotment in Wales when I was a little girl (more than 50 years ago now!) I wasn’t aware it was to do with worms, as far as I was concerned I used to love lifting the lids and putting all the cuttings in. It was a very grown up job! This is great. I use plastic pipes in the same way in each bed. I top them up as I harvest and tidy up the outer leaves and just pop the lid back on. Would you give more details about your friend’s decorative bottomless pot that you showed pictures of? I’m interested in how wide it is, how deep it is buried, and if it has holes in the sides or is just open on the bottom. I like the idea of using a pot that is just open on the bottom, so one could use a material like clay that would be difficult to drill holes in the side. Your website is very informative, and I frequently re-watch your video with Geoff Lawton for inspiration. Thank you for sharing your experience and expertise! I’m also trialling an ‘in-pot’ worm tunnel. 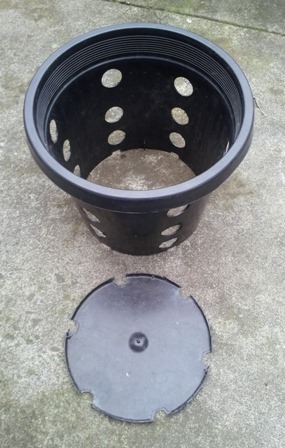 It’s not a wicking bed, just a normal large pot with a smaller pot with holes (and no bottom) in the middle. I started it a few months ago with compost worms taken from my worm farm. I planted pea seeds around the tunnel but the resulting seedlings have been almost all eaten by slugs. 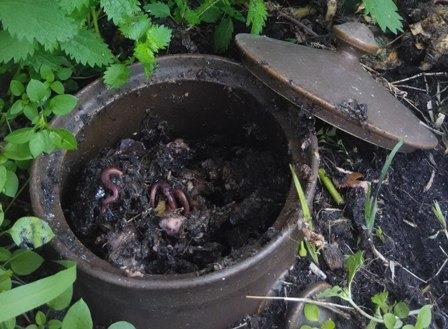 Despite this setback, I’m going to continue my experiment to see if the compost worms can survive in the pot over summer (and if I can get something to grow in the pot without it being eat by slugs first!). 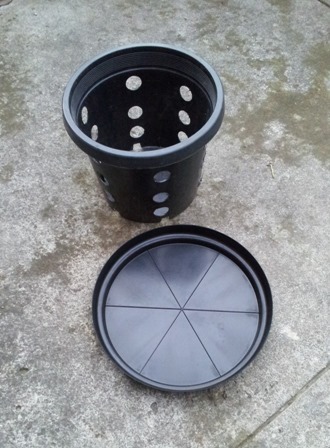 If the pot is made of black plastic and sitting on concrete or near a brick wall, it will heat up a lot, so it may be an idea to place something around the pot in summer that doesn’t conduct heat or is reflective, some pieces of wood, a light-coloured material such as coreflute sheet (from a recycled corrugated plastic sign), or anything of the sort to keep the heat down for the worms. How do you ensure the worms come back to be removed for Winter? Compost worms that we use in worm farms do need winter protection in extreme climates as they can’t burrow very deep, but earthworms are different, they burrow very deeply and are capable of looking after themselves as they do in Nature when they’re in the ground, which is where the worm tunnel will also be located. This composting method is very old. 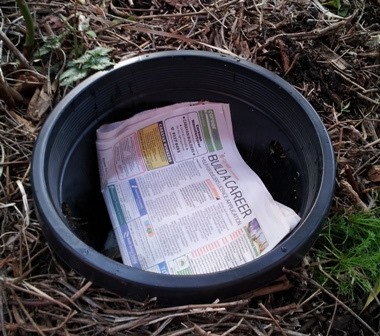 In fact, Mother Earth News has a post from 1976 whereby a galvanized trash can is used. I would have to believe that earth buried composting pits are much older than that; they probably date back to antiquity. The best solutions are the simple ones: such as using a degradable container like galvanized metal which eventually does break down within a single human’s lifetime (plastic does not), and using the free labour of natures’ largest legion (the terrestrial micro-herds). Thanks Rylan, I was thinking how unpleasant it would be to dig a hole deep enough to bury a trashcan, then dig it out later on to move it to another spot in the garden! I’m a no-dig gardener as you would guess. My council gives free biodegradable plastic bags (made from cornstarch) for kitchen scraps. When it’s full I drop the whole bag in the ground, break it a bit with a shovel, and cover it up. The bag decomposes slower than the scraps because I find small coloured bits of the bags later on but never any food scraps. Check with your council whether these bags are actually made completely of biodegradable materials or whether they’re made of plastic and cornstarch, mixed together, as bags made this way are designed to break apart into small pieces of plastic, which gets around the problem of whole plastic bags littering the environment, but they leave small bits of plastic everywhere, which isn’t good! I live in the Dallas/Ft. Worth area and have tried something similar in my garden bed where I dug a hole and buried the kitchen scraps hoping that the earthworms would enjoy the feast. I seemed to have many worms in the soil when it was planting time so thought if I started this in the late fall after harvest and over the winter months the scraps would be broken down and soil would be ready for spring planting. Unfortunately it seems that all I did was feed the fire ant population and now my garden is infested with them. I plant in a bed 30′ x 5′ and had 6 large colonies of ants by spring with which to contend. I will not use poisons to rid the bed of them, but I have not found any natural ways that seem to work either. I have tried cornstarch, boiling water, digging them out. Open to suggestions. Our local extension office and Texas A&M all support the use of insecticides. Ants in a compost heap or worm farm are a clear indicator that the conditions are way too dry and there is insufficient moisture! In my article Strange Brew! Homemade Garden Sprays , in the section ‘Borax Ant Bait’ I describe how to make your own ant control bait. Thank you. I will follow the recipe and see what happens. I love the idea but my garden soil’s got small black ants that attack any creature they can. Last week I saw them competing with a wasp over a green caterpillar, and the wasp gave up! They also devour those slow, juicy white grubs with orange heads that live deep under the soil. Ants would be drawn to the food in the worm tunnel so I wonder if any worm found in there would suffer the same fate? Currently I just dig my kitchen scraps directly into the soil. I don’t know why people say it takes a year for it to decompose because if I dig the area a few weeks later for planting it’s completely disappeared and a sweet smell fills the air. I like the novelty of a bucket though to make it more systematic. Hi Edward, ants are attracted to fairly dry soils, and they dislike moist soils which worms like, so there’s a chance your soil is too dry! Is it OK to create these worm tunnels for Australian native plants in a domestic garden in suburban Darwin, Northern Territory? If so, would install for my eucalypts, grevillea, exstipulata, and tephrosia. Yes, an in-ground worm farm such as a worm tunnel will work perfectly well in an Australian native garden, just be mindful that some native plants don’t like root disturbance so don’t dig too much around their root zones. Members of the Proteaceae family such as grevilleas have cluster roots near the surface and dislike root disturbance.